Attached you will find two photos. My boyfriend said he did see another cicada, considerably smaller than the one photoed, flying around the burrow. Sadly, he sprayed that one, too. I am not sure if it flew away or not. I assure you, now that we are more educated, any future cicadas will not be harmed. They seem like intriguing creatures. Please let me know if the photos do not work. Have a great night. The dead cicada killer above is definitely female. You can see the protruding stinger at the tip of the abdomen. Males have a much shorter "pseudo-stinger" and is quite useless. 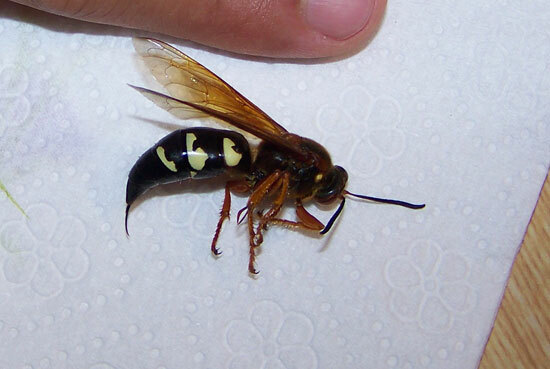 While cicada killer wasps seem intimidating, they are really quite docile and do not bother humans. Thanks for not killing them any longer. Thank you for the information. I will ensure my boyfriend understands fully. I won't even kill a spider or a fly. I cohabitate with everything. 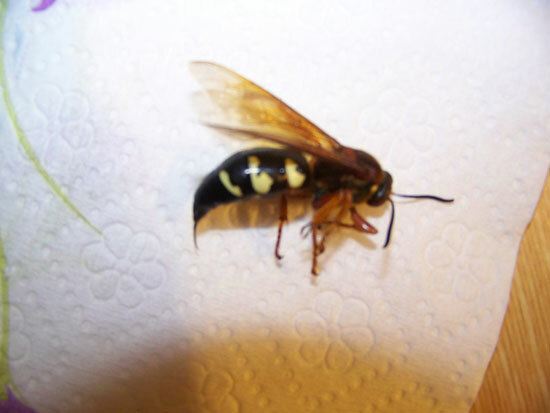 They do resemble wasps so closely, I suppose I can understand why some would be uneasy. This one burrowed under the grill during grilling season. I still feel bad! Thank you for your responses. Have a great day.